This African Safari cake was my son's fifth birthday cake. He is fascinated by African animals and Africa. I asked him what sort of cake he would like and he said an Africa-shaped cake with African animals on. Well that was a bit of a challenge! But I think I managed to pull it off. 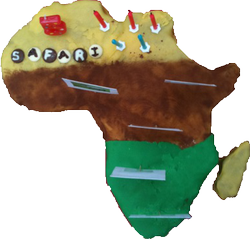 I've put together instructions for how you can make your own Africa shaped cake including a template that you can use. You could decorate it using the red, green and yellow colors found on many African flags. Or you could create a scene on top of the cake using fondant. We went with the African safari theme and I decorated using photos of African animals. This cake took about 2.5 hours to make from start to finish but I did have a helper for the decoration part. So we're going to be making an Africa shaped cake. Let's take a look at Africa. It's not the easiest shape to make a cake from is it! I included the island of Madagascar in my Africa cake as my boys love the Madagascar movies and the different wildlife found on Madagascar - they watch a lot of nature documentaries. After studying the shape of Africa I decided that I could make the cake from a 9" round cake and an 8" square cake. You'll need to bake two cakes using a 4 egg sponge cake mix. I made African wild hunting dog sponge cake because that was my son's favorite animal. But a plain sponge is fine. Of course you can make the cake bigger or smaller if you like. You can scale the template. This camouflage cake or animal print cake depending on the colors you use is great for an army or safari party. While your cake is baking you can prepare your Africa cake template. You can use this Africa cake template. You'll need to scale the image to the size of cake you want to make and print it out over multiple pages and stick it together. Here's how you can easily make a birthday from a template when you have an image or outline you would like to use. I recently used this approach to make an Africa cake. Now you should have a round cake and a square cake - cooled. And an Africa template printed out and stuck together. For this cake you'll need one round cake and one square cake. You can make a plain sponge cake or a chocolate cake. Or you could make a zebra cake or an african wild dog cake like I did. Now cut the round cake in half and arrange the cakes as shown in the picture. Place the template on top of the cake and fix it in place with a few wooden food picks. Cut the cake outline with a sharp knife. Use spare cake to fill in any gaps. Any leftover cake can be used to make cake pops or frozen to eat at a later date. Use jelly or jam to stick the bits together. My son loves marzipan (almond paste) so I covered his cake in yellow marzipan. 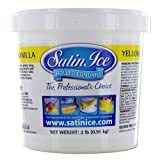 But yellow fondant would also work. Add a layer of jam or jelly to the top of the cake to help the covering stick. Cover part of Africa with green fondant to create a greener area. You can make this accurate if you like. I just went with the bottom third - close enough for a five year old! Now dust the grasslands of Africa with cocoa powder to create a savannah area. Leave the top part of the cake yellow for a desert area. Now you can add candles to the cake. I also spelled out the word SAFARI in fondant on chocolate buttons. You could decorate with fondant animals or African animal cake toppers. I printed out photos of animals and make photo frames from card to look like pictures that had been taken on safari. I wish I had displayed the cake on a nice blue chopping board or platter to represent the sea. It was all a bit of a rush at the end and I didn't even manage to tidy up the loose cocoa powder! Oops. An alternative to the photo toppers would be to use African animal cake toppers. And animal print candles would look fantastic. We went with red and blue because they are my son's favorite colors. Tip: Lots of animal party supplies include tiger print and of course tigers are not African animals. We said anything with orange and brown stripes was a striped hyena. That kept my son happy. He only wanted African animals at his party! 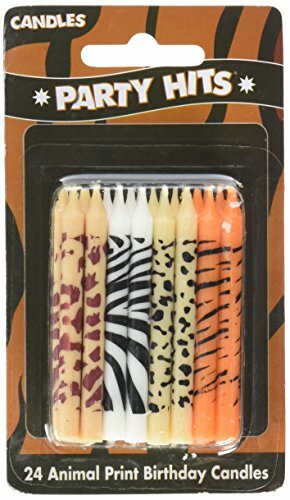 Wild Safari Animal Party Supplies - Roar! 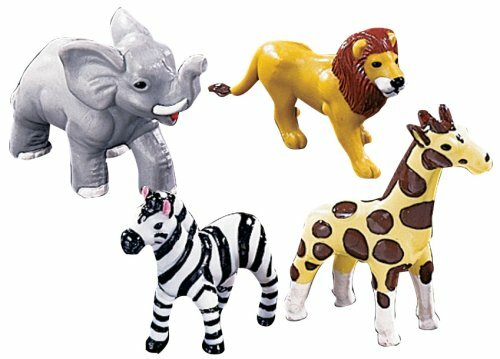 A collection of wild safari animal party supplies to make your birthday party go with a roar! These party supplies work well for jungle and zoo birthday parties too. Are you looking for fun snake crafts? How about an fuse bead snake (ironing bead snake) that you can make from Perler beads or Hama beads. The Aye Aye is an animal native to the African island of Madagascar. The Aye Aye is a species of lemur. Find out all out this unusual creature. The African Wild Dog or African Hunting dog is a beautiful animal. Sadly now endangered, there are only a few thousand of these animals left. Learn all about the African Wild Dog. The hyena is a fascinating animal. It's not a dog as many think. Learn lots of interesting hyena facts. Did you like the Africa Cake? That is an awesome cake! Great to let the kids help and learn about cooking and geography! I am in total awe of your creativity and baking prowess. This whole page is the total resource for baking a very unique birthday cake. Love it! This is amazing! I love geography, and cakes too! :) Impressive cooking skills, I must admit! Well done! I love your Africa Cake and am very impressed by your talent and creativity, not to mention your son's interest in Africa at the age of 5!